The vast majority of headache symptoms are benign and relate to the well-known and common conditions of tension type headache (TTH: episodic and chronic), migraine (with or without aura: episodic and chronic), medication overuse headache (which may arise from TTH or migraine) and cluster headache. (1) Other headache subtypes are much rarer and are encountered infrequently in the primary care clinic. The so called sinister headaches, which have serious and sometimes life-threatening pathology, are very rare. However, they are frequently uppermost in the patient’s and doctor’s mind on presentation and the possibility of a sinister headache must be dealt with during the initial headache consultation. 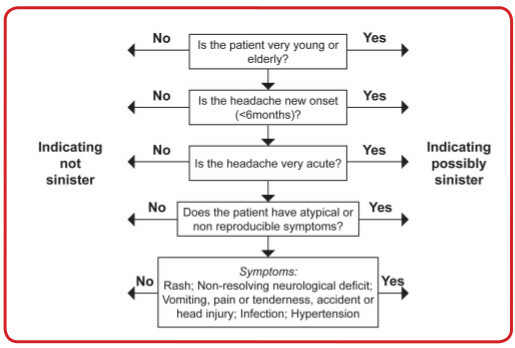 This brief paper describes the signs and symptoms of sinister headaches (known as red flags) for the health care practitioner in primary or secondary care to consider when assessing a new patient presenting with headache. The guidance is based on evidence-based clinical guidelines designed for primary care(2,3) and on our combined experience of patients encountered in the headache clinic and at Migraine Action (Figure 1). The acute symptoms described below usually mean that the patient is likely to need urgent hospital admission. A sudden onset, severe headache or acute new neurological deficit may indicate an intracranial bleed or some other intracranial catastrophe. Symptoms such as fever, meningism, photophobia, confusion, falling consciousness level or seizures may indicate a serious infection such as meningitis, encephalitis or an abscess. The acute and subacute symptoms described below usually mean that the patient is likely to require an urgent hospital admission or an urgent specialist review. Symptoms of jaw claudication, polymyalgia, temporal artery tenderness and raised ESR may indicate cranial arteritis. Brief episodes of uni-ocular vision loss, morning headache that clears on sitting, headache associated with cough and papilloedema are symptoms of raised intracranial pressure. Progressive limb or facial weakness, gait unsteadiness, confusion, personality change, new visual field deficit, double vision, ptosis (including Horner’s Syndrome), dysarthria or cranial nerve palsy may indicate a progressive neurological deficit. Focal or generalised seizures and bizarre or stereotyped sensory or visual symptoms may indicate cortical irritation. However, sensory and visual symptoms are also encountered in migraine with aura1, and a differential diagnosis needs to be considered in these cases. Postural headache and headache associated with cough may signify meningeal irritation. In this case, the physician should also consider investigating the possibility of infection (see above). New-onset headache plus a past history of neoplasm, which may indicate a malignancy. New-onset headache in older age groups. Where the headache is progressively worsening in the absence of other features. 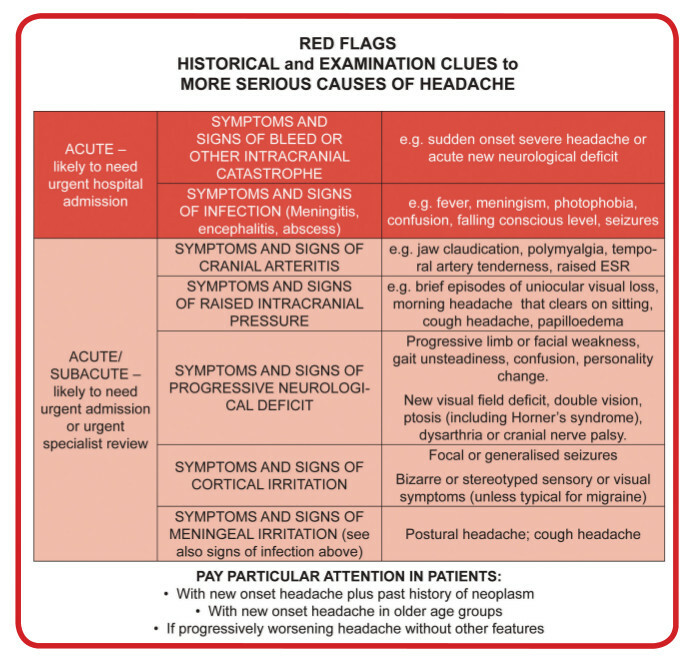 New-onset, acute headaches associated with a range of other symptoms (e.g. rash, neurological deficit, vomiting and pain or tenderness, accident or head injury, infection or hypertension) and neurological change/deficit that do not disappear when the patient is painfree between headache attacks. Non-reproducible (isolated) symptoms (e.g. unusual symptoms in a patient), prolonged auras, very acute headaches (time to maximal intensity <5 minutes) and headaches with neurological deficit with a history of <6 months (suggestive of brain tumour). Headache that is subjectively the ‘worst’ experienced, but which is different from other severe headaches previously experienced, and onset at a very young (<5 years) or old age (>50 years). In addition, simple questioning may provide pointers to problems with other conditions, e.g. chest disease. Simple tests, e.g. blood count, ESR (in patients aged >55 years) and serum biochemistry can also provide important clues to diagnosis. Reconsideration of red flags following hospital admittance or specialist review. – Where there is chronic headache resistant to treatment. – Patient or physician uncertainty as to diagnosis and/or treatment. – Patient suitability and consent. Neuroradiology will consider both MRI and CT scanning to be appropriate screening procedures. Although CT scanning is quicker and therefore, more easily available, it does have limitations. CT tends to be used for more acute situations and MRI is particularly useful when there is a query around the base of the skull, as this procedure gives a clearer view. There may be variations in availability of MRI, depending on the locality of the GP practice. MRI scans cannot currently be requested by local General Practice for acute headaches and the GP is advised to admit or refer the patient urgently, depending upon the clinical situation. However, GP-arranged MRIs are allowed for patients in the community with chronic headache where the result is expected to be negative and that management will continue in primary care. Dowson AJ, Sender J, Lipscombe S, Cady RK, Tepper SJ, Smith R et al. 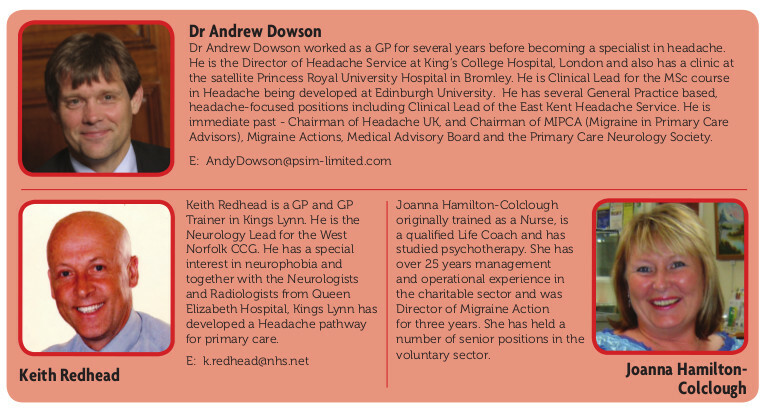 Establishing principles for migraine management in primary care. IJCP 2003;57(6):493–507.